A few months ago I was at the Berlin Blockchain awards, and it appears that ‘blockchain’ is the new buzzword that startups and tech-folk like to throw into everything, without completely understanding the concepts behind it. Whether you believe that blockchain is just a new buzzword for the industry or a truly revolutionary technology, developers are often uncertain of how they can use the blockchain concept in their applications. Eris Industries’ solution might make this a bit easier. Eris Industries packages blockchain and smart contract concepts to make them more usable and apply them to your project. The best projects for this sort of technology are ideas that need a form of decentralized trust and security. In this article, I will create a demo application that is a library of names of privileged users for a hypothetical situation. In the final section of the tutorial, the application will let you change a name in the list and check the values. Installing Eris is confusing, the instructions on their homepage didn’t work for me, and I ended up following the steps in their more in-depth instructions instead. 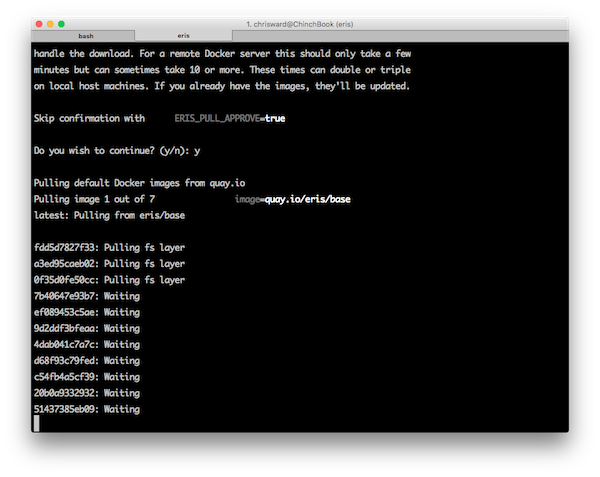 For me, on my Mac, I installed Docker Toolbox (Docker is a requirement) and then installed Eris with Homebrew. 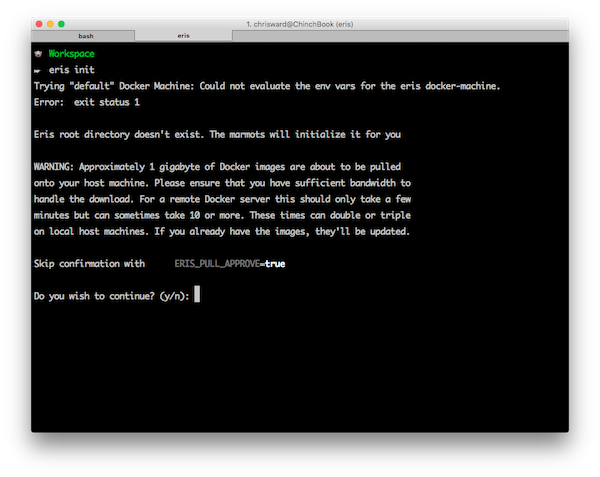 Note: It isn’t clear in the Eris documentation, but it’s best to run the rest of the commands in this tutorial within the Docker context. This mainly applies to Mac and Windows, find more details here. This command starts a service based on the keys service definition, these definitions are found inside the ~/.eris/services folder. Eris creates some by default for pre-defined application types (e.g. Tor, ipfs, and bigchaindb), but you can also create your own. If you want to read more about keys with Eris, then I recommend their key tutorial. genesis.json: Tells eris how to instantiate a particular blockchain, providing the “genesis” state of the blockchain. 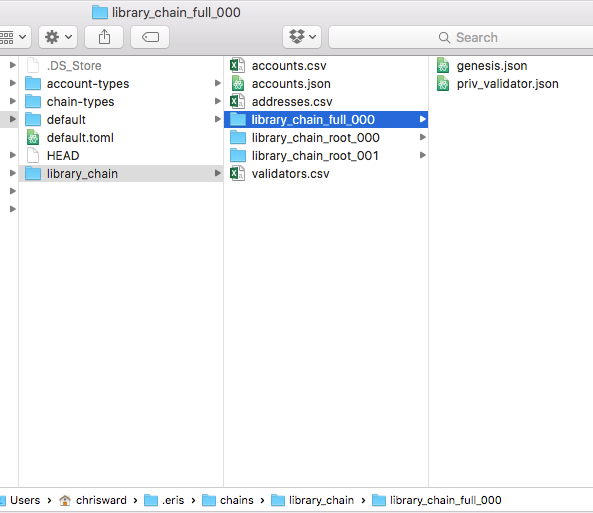 accounts.csv and validators.csv: You can use two files later to create a new genesis.json if it gets lost. addresses.csv: Has the addresses and the “names” of the nodes. This file should be reasonably self-explanatory, it defines a string variable and the relevant set and get functions. Some of these job declarations make more sense than others, read the job specification document for more details. Query results from the contract. 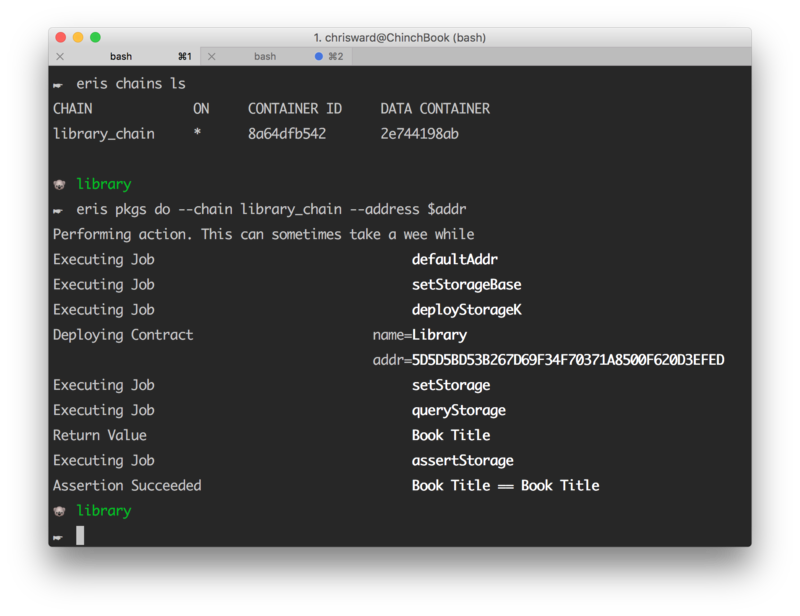 This command will find the jobs you declared, deploy them and then return the assertion made, which in this case, is that the book title is a string. Now it’s time to write some code that interacts with the blockchain and performs actions upon it. This is still a simple example that allows users to set a new value for the book in the blockchain, and to then check the current value. This first code block creates requirements and then some Eris specific variables for the abi (a ‘translator’ between the blockchain and the application), the accounts mentioned earlier, the IP address of the chain (in my case, a boot2docker ip) and initiates a manager and contract for the chain. Note: You may need to set the value of NODE_PORT to a suitable value. Look at the output from the curl command and the Node.js application to get a slightly clearer idea of what is happening behind the scenes. 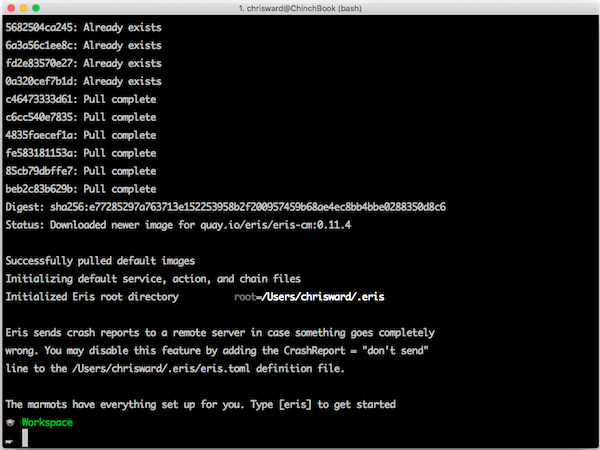 On first impressions it may seem that it is complex to get started with a basic application using Eris. But unless you encountered any problems, these setup steps shouldn’t actually take too long and then you’ll be ready to start using a blockchain in your applications. Actually coding an application that uses a blockchain is a big and complex topic and I have barely touched the surface. For next steps, I recommend you make sure you have a bonafide use case for a blockchain in your application and then read the tutorials on the Eris website. It’s going to be a bumpy and at times confusing journey but I would love to hear your experiences, thoughts and questions.